Properties in Chantilly Rieux-Angicourt Station average 4.6 out of 5 stars. Renovated farmhouse in a village 40 mins north of Paris in the Picardie region. Property 6: Renovated farmhouse in a village 40 mins north of Paris in the Picardie region. 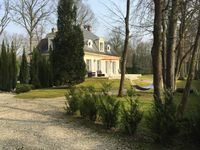 Beautiful house in the heart of Chantilly, near the castle, the race course ..
Property 21: Beautiful house in the heart of Chantilly, near the castle, the race course ..
Property 31: Holiday rental of a large fully equipped house. 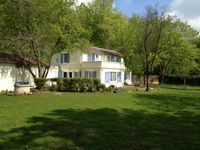 Charming Longère with garden 1h from Paris. Property 33: Charming Longère with garden 1h from Paris. A gorgeous chateau, well situated in the beautiful countryside with easy access to enjoyable towns and the historic Glade of the Armistice. Perfect for our family of five. Great property well situated near Chantilly. Would definitely recommend.